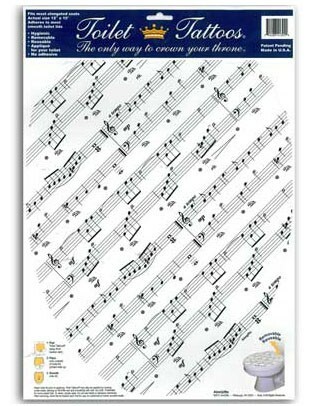 Music Sheet Toilet Tattoo Cover – *CLEARANCE! Add a little flair to your porcelain throne with the Music Sheet Toilet Tattoo Cover! This oblong shaped cover is a unique piece of bathroom decorum that any music lover will enjoy. Done in three easy steps, simply peel, place and smooth to transform your toilet into room decor! There is no adhesive to this cover and the tattoo sheet is easily removable and reusable. Fits most elongated toilets. Size: 12″ x 15″.